On Saturday, February 15, 25 people, several beekeepers among them, came out to swarm two Home Depots and one Lowe’s store. More info coming soon. On Saturday, February 15, from 11 AM to 1 PM, show the bees some love by joining us at the Natick Home Depot, the Framingham Lowe’s and.or the Waltham Home Depot. 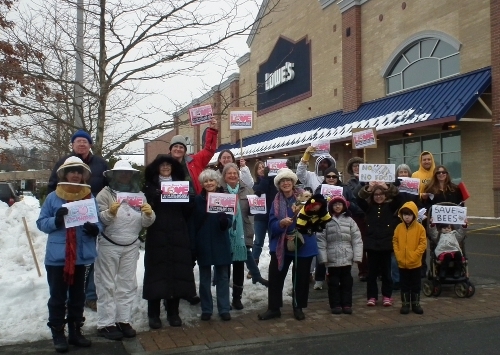 On February 15, beekeepers in costume and friends of bees will swarm to the Home Depot stores in Natick and Waltham and the Lowe’s store in Framingham as part of a national week of action to support the bees. Bees and other pollinators, essential for the two-thirds of the food crops humans eat every day, are dwindling worldwide. Last year, U.S. beekeepers reported losing 40-100 percent of their hives, and they are likely facing another winter of historic bee die-offs. Neonicotinoid pesticides have come under scrutiny in this context. A groundbreaking pilot study released last summer found that many so-called “bee-friendly” garden plants sold at Home Depot and Lowe’s contained neonicotinoid pesticides with no warning to consumers. Protesters will collect signatures on Valentines cards, asking that these stores “Show Bees Some Love” by removing bee-killing pesticides and plants from their shelves. These friendly protests are part of the Bee Week of Action taking place all over the US, with over 27,000 people delivering more than half a million petition signatures to the retailers. It is organized by Friends of the Earth partnering with Beyond Pesticides, Beyond Toxics, Center for Food Safety, CREDO Mobilize, Friends of the Earth Canada, Northwest Center for Pesticide Alternatives, Organic Consumers Association, Pesticide Action Network, SumOfUs and the Xerces Society for Invertebrate Conservation, and the Boston Metrowest BEElieve group. Bring your beekeeper suits, veils, and smokers, also banners and flowers. Kids too: this is a friendly, loving action! ♥ We are delivering Valentine’s card to the store manager with cupcakes and a friendly conversation. We will ask that he/he forward them to their CEO. Friends of the Earth (www.FOE.org) will follow up with them to make sure they’ve heard us, loud and clear. ♥ A big part of “loud and clear” these days is pictures. We are taking lots of them for a special page on www.transitionwayland.org, for Friends of the Earth for their pool of pictures from around the country (www.pinterest.com/foeus/food-and-technology/), and for the local media. write a Letter to the Editor to your local media or ask the editor to cover the protest (they will have received our press release). For info (and picture), refer to kaat@transitionwayland.org. create a real buzz Facebook and Twitter (#BeeLove)! 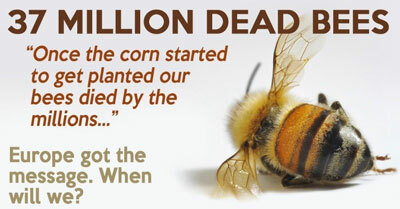 call the other nurseries and garden centers where you buy plants, ask them too about neonics. check out this study that found that many “bee friendly” home garden plants sold at Home Depot, Lowe’s and other leading garden centers have been pre-treated with these pesticides: http://libcloud.s3.amazonaws.com/93/88/f/3354/Gardeners-Beware-Report-11.pdf. check out this handy list of the names that neonics go under, and the most common products that have them: www.beyondpesticides.org/pollinators/chemicals.php. check out our BEElieve group, which unites bees, beekeepers and bee friends in the Metrowest neighborhood: www.transitionwayland.org/projects/beelieve/ and contact info@transitionwayland.org.